Najnovšie čísla potvrdzujú, že autobusy a autokary sú bezpečnejšie, ako cestovanie autom, motocyklom, bicyklom, električkou, či dokonca peši. The safest way to travel by road. 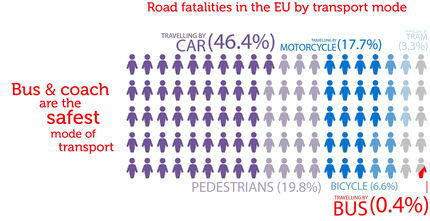 The latest numbers confirm that buses and coaches are safer than cars, motorcycles, bicycles, trams and even pedestrians. Not only that, but they are on the same safety level as trains, which is incredible considering that they have to share roads with other users and transport modes! Moreover, on average, one bus is capable of replacing at least 30 cars, so if more drivers left their cars at home to travel by bus and coach, there would be less congestion and ultimately fewer accidents! As any true professional will tell you, every road accident is one too many and even though the bus and coach industry already has an impressive road safety record, it is continually striving to improve its safety record, notably by promoting a high level of professionalism through stringent initial and continuous driver training and improved vehicle design and technology, which is a win-win for everyone!